Porto Portugal is amazing, that’s what I will start with. Porto has a Population of 1.8 million people in its Urban area. Porto’s most famous export is Port Wine, to which the city gives its name. 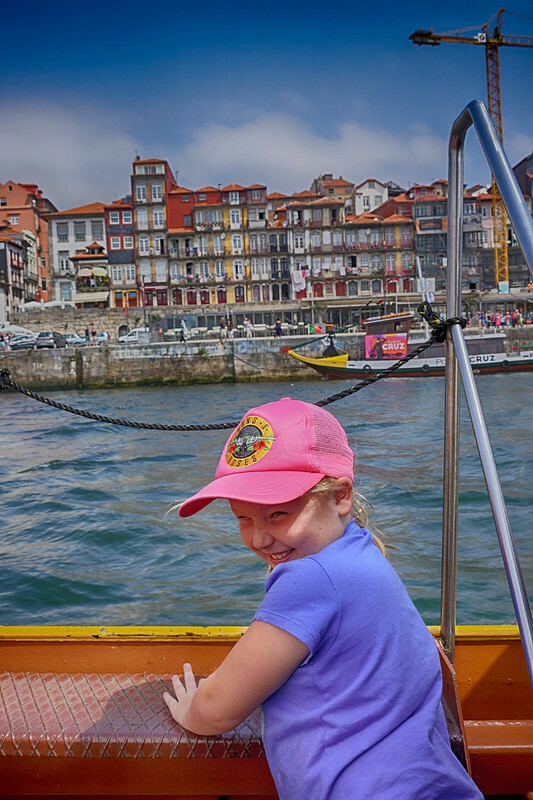 As a part of the hop on hop off bus pass, we had a free short cruise on the Duoro River included. The mighty Douro runs from near Duruelo de la Sierra in Soria Province and meets the Atlantic Ocean at Porto.The Douro is one of the major rivers on the Iberian Peninsular stretching for nearly 900 kilometres. Traditionally the Douro was used to transport wine to Porto from the Douro Valley. Daming of the river in the 50’s and 60’s has since stopped Port Wine being transported this way. The Duoro is now popular with cruise companies like AAPT etc. Porto 6 Bridges Boat Cruise. Follow in the footsteps of the wine merchants of Portugal on a classic 50-minute “Six Bridges” cruise of Porto. Sail down the River Douro along the route of the old “Rabello Boats” that served Porto and Vila Nova de Gaia. Reach the Foz do Douro, and more. We have personally done a 6 bridges boat cruise and it is AMAZING. Book this experience HERE. Family Travel Tip: The boats are well equipped with plenty of seats and some even have toilets. You can sit inside or out, whatever you chose. If you are travelling on a nice sunny day I suggest you grab some extra bottles of water before you head off. Also if you have a water lover like we do be careful of the water splashing over the sides, it was amazingly attractive to our 7 year old! 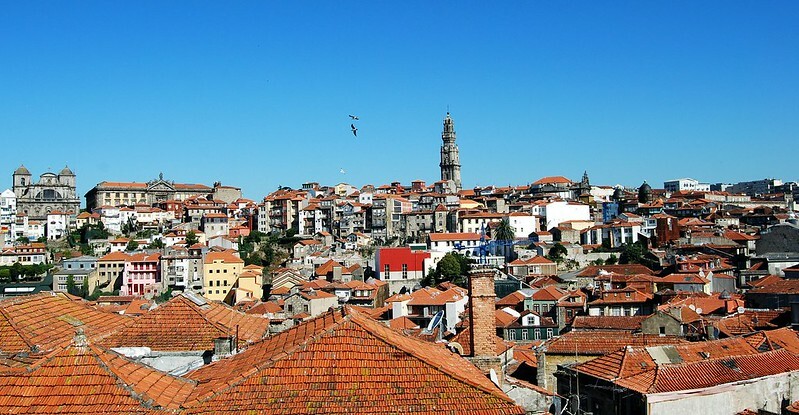 The Historical Centre or Old Town of Porto was proclaimed a UNESCO World Heritage site in 1996. Porto is one of the oldest centres in Europe. The settlement dates back centuries to when the city was an outpost of the once mighty Roman Empire. Originally Porto was named, Portus Cale, a combined Celtic-latin name that has often been referred to as the origin of the name ‘Portugal’. 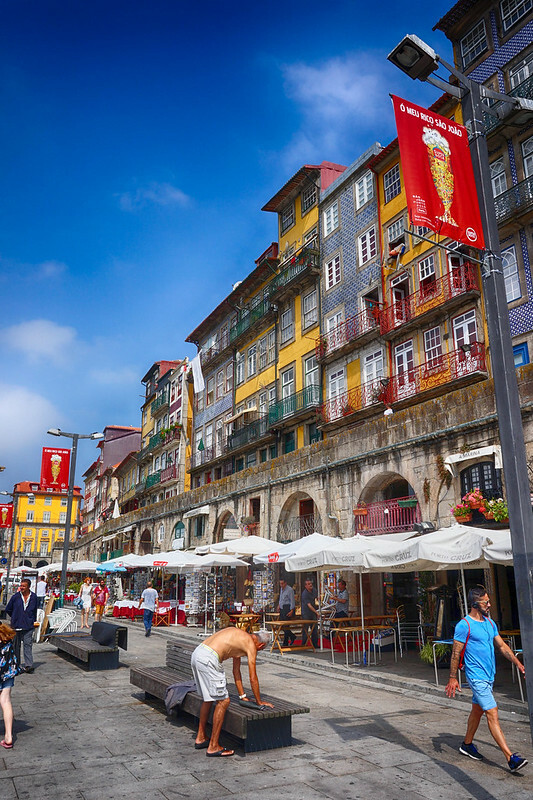 The banks of the Porto Old Town are alive with restaurants selling fresh fish and the local wines, street performers juggling and singing will entertain you. The steep incline of the Old Town area will test your weary muscles after a day of sightseeing. Porto is an amazing town part original, part modern. It sometimes gives you the sense that it’s a shanty town in decay. I say it’s very Portuguese when I try to describe it to people. It’s certainly on the tourist trail but not fully developed like other cities you visit, it still feels authentic and would not be out of place in its current form hundreds of years ago. Walk through the vibrant history of one of Europe’s oldest cities and discover some of its still hidden gems with a local and knowledgeable guide. For further details and booking click HERE. Family Travel Tip: Having a pram will be hard on some of these steep paths. If you do have a carrier and putting the baby in that, take it easy and rest when you need to. Little ones may struggle with the steep paths. There is a funicular that takes down to the river. Our kids loved it and the view is amazing as the river and bridges come into sharp view. When you see a picture of Porto, it is most likely a picture of one of the cities many bridges. 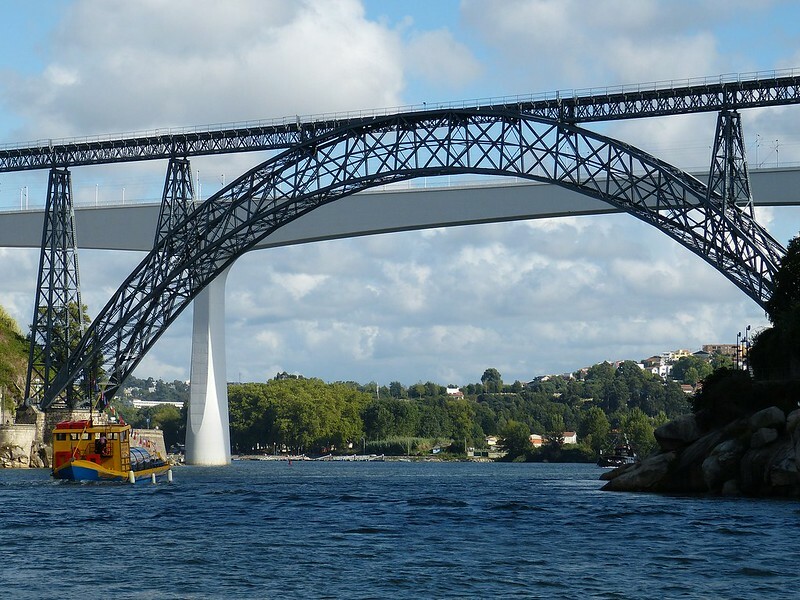 Porto bridges are iconic symbols of the city and its amazing bridges hold many world records. 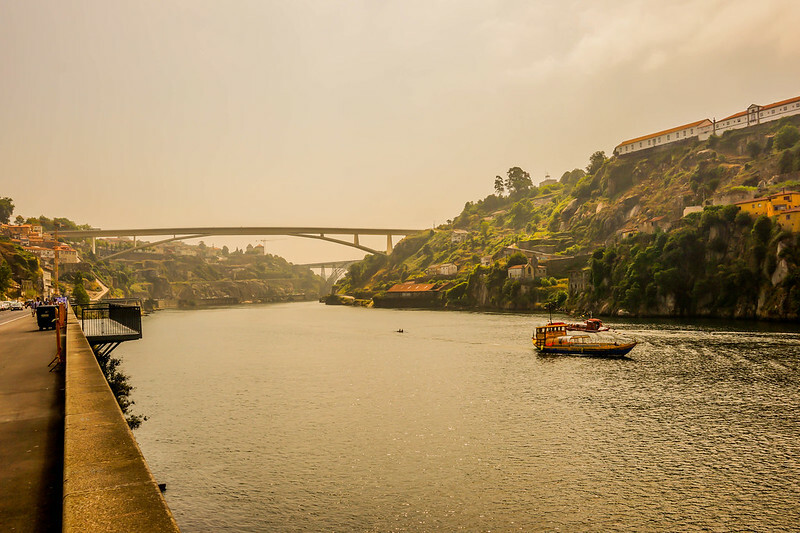 7 bridges have spanned the Douro in modern times, 6 are still in use today. Dom Luis 1 bridge is the most famous bridge in Porto (pictured above). Designed by Teófilo Seyrig, Seyrig was a pupil of Gustav Eiffel of the Eiffel Tower fame. The Dom Luis bridge was opened in 1886 and comprises of 2 overlapping iron decks. This masterpiece is 395 metres long and 8 metres wide. The Metal arch is still considered to be the world’s biggest arc ever constructed of forged iron. Today the top deck is used for trams and tourists. Maria Pia was designed by Gustav Eiffel. Maria Pia was opened to the public 1877. Eiffel’s bridge was a faithful servant to the people of Porto for 114 years. Maria Pia has a double-hinged arch that supports a single-track railway deck on truss pillars. The Portuguese Government classified Eiffel’s Porto masterpiece as a national monument in 1982. Eiffel’s design was ahead of its time. Maria Pia gained its international recognition in 1999 as being of historical importance to civil engineering. Maria Pia has not been operational since 1991. I could go on forever about these amazing structures in Porto. Hence, this is why Porto is sometimes referred to as the city of 7 bridges. People who love their wine are extremely lucky that they can taste the best of Portuguese wine in Porto. There is no need to take a trip to the Douro Valley of you don’t want to. On the opposite side of the river to Porto is Gaia. Gaia (Gaia is part of the municipality of Porto) is home to the famous wine houses and wine caves of Porto. The wine companies of the region age the wines they produce in the Douro region in cellars, in old wooden barrels in the wine caves of Porto. It has been done this way for hundreds of years. 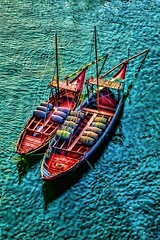 The only change is the wine is not brought downstream by traditional boats anymore. Visit the oldest port wine cellar in Porto and taste the best wines of Portugal on a wine tour of the city. Visit 2 typical wine houses and sample some of the wines of the Douro. Family Travel Tip: When we looked into doing a wine tour most of the tours were happy with the girls coming along with us. Just check the website or with the company before you go to avoid disappointment. Stretching out from the centre of the old town of Porto towards the ocean is the Porto coastline. Along this section, you will find secluded rocky beaches with people sunbathing, swimming and playing ball. Family-friendly swimming area’s with lifeguards are everywhere. You will find promenades that you can stroll along while watching the ships in the Atlantic ocean and the waves hitting the beaches. You can have a meal or a drink at many of the wonderful cafes that sit right on the sands of the Portuguese coast. You can buy amazing churros from street vendors filled with chocolate and jam. 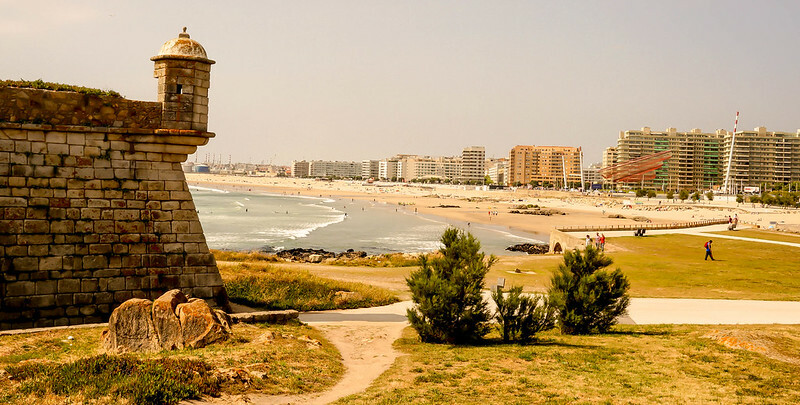 You can visit the many fortifications that once helped protect the city of Porto from foreign fighters. You see the amazing sea creatures that live in the Atlantic ocean at the Sealife aquarium. Family Travel Tip: The paths are quite wide in this area so getting the pram out and about will be a great idea. Bike riding for older kids is popular while stretching the little one’s legs with a play on the beach will be fantastic for them. Find a tour in Porto for you! Find something in the 100’s of tours available that suits you. From walks to day trips, from beer tasting to eating. You will find something to suit everyone in Porto right HERE. Are you planning a trip to Portugal? It is a country we absolutely love so here are some more Portugal articles from Wyld family Travel. We hope you like them. Portugal has been on our to-visit list for a long time. It looks beautiful! Porto is a truly amazing city – I spent there only a two days many years ago, I still remember it as one of the mist charming cities I’ve ever visited. I didn’t really like Porto wine, but I find Portuguese cuisine great. The city looks so charming! The colors of the buildings combine perfectly with the waterfront. I’d love to walk through the historic old town and then relax by the coastline with a glass of wine. 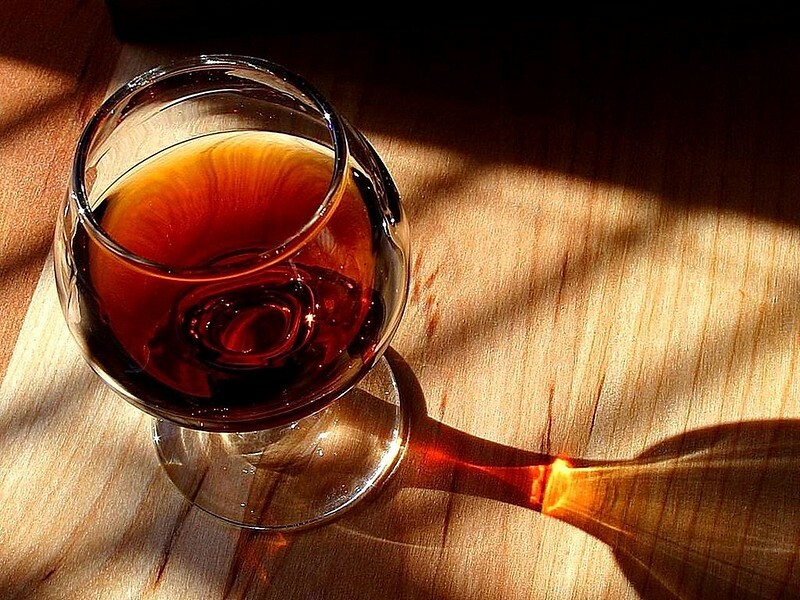 My husband and I both love port wine and we will be going to Portugal at the end of June. Our plans were just to go to Lisbon but maybe we should include Porto. It looks lovely. OH that looks amazing. The river cruise is definitely something that people shouldn’t miss! and the wine too….great tips! I also loved visiting Portugal and have sent many family and friends there over the years. I was especially curious how you handle wine tastings with kids along, but it’s great to see that many operators are fine with it, and that the kids find enjoyment there as well! Nice job highlighting all the wonderful things in Porto. It’s a beautiful place and one I’m looking forward to seeing again. We didn’t make it to the beach though and your pictures show me clearly that I missed out! Next time. 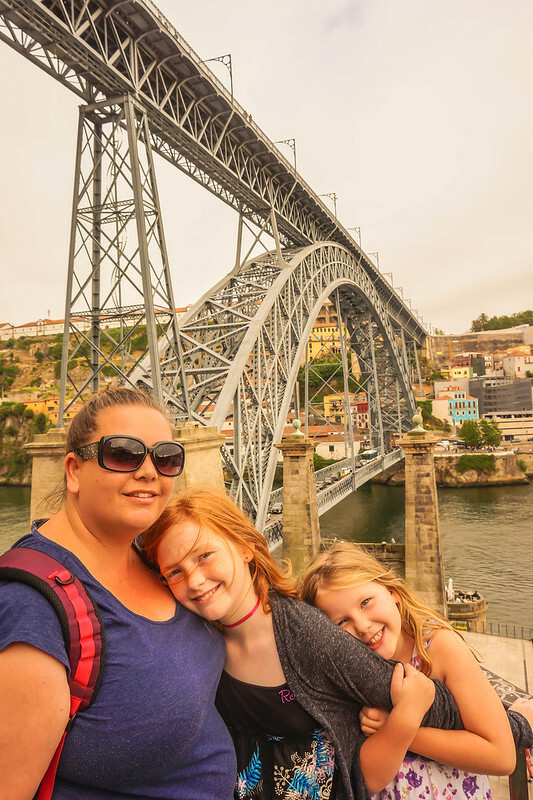 You did a great job highlighting all the reasons to visit Porto. I can’t wait to return! But we missed out on the beach during our stay – next time for sure! The imagination I have about Portugal is a country full of colour and happy people. I have never been there, but it is on my list. I also would like to explore other places rather than Lisbon there. I’ve always wanted to visit Portugal and Porto seems like such a lovely place. Have you also visited Lisbon? I really like your five suggestions. I always wanted to do a wine tasting tour and yes, Port wine is one of my favorites. The Porto Old Town looks amazing and I would definitely love to take a short cruise on the Duoro River. I never realized how colorful the buildings were in Porto! They’re just magic to look at – and the river and coast are stunning – so picturesque! I’ll have to make Porto a stop next time i’m in Portugal. Great suggestions! I would love to visit Porto sometime–the old town area looks fantastic! A river cruise would be fun as well–I can imagine the views from the river would be beautiful. And, wine tasting sounds pretty awesome, too! That would be so fun to visit the home of port wine. What a scenic place! The rustic buildings look totally amazing! We would love the opportunity to visit Porto. Well I have already voiced that I wanted to go to Portugal. It is in my top 5 places I want to venture to before we head back to the US next year. I love that it’s still so authentic! It’ll be interesting to see how it develops as more tourists learn about it.